The Republican Party has exacted a pound of flesh from the people of New York and New Jersey. It’s more than a slap in the face. It’s a kick in the teeth. In an apparent act of political retribution against Republican members of Congress from the Northeast, Speaker John Boehner refused to allow a House vote last night on a disaster assistance bill for victims of Hurricane Sandy, who are concentrated in New York and New Jersey. The above quote is from a furious Republican Congressman, Peter King of New York. 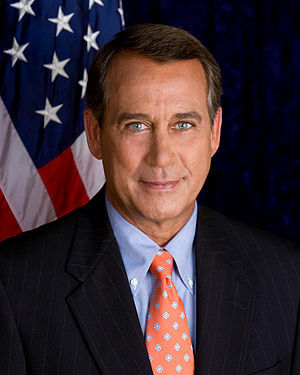 Speaker Boehner is finished. He must be. Either that, or the Republican Party — dominated by representatives from the Southern states, Great Plains states, and Rocky Mountain states — confirms itself as a parochial regional party. Self-destruction of the speaker and the Republican Party, combined with the general disarray and dysfunction of the Federal government, would likely lead to a historic political realignment in America. The outcome is impossible to predict. Maybe good, maybe bad. It’s the Black Swan political upheaval of the century. This entry was posted in Democracy, News and tagged America, Black Swan, Congress, Disaster relief, Failure, Hurricane Sandy, John Boehner, New Jersey, New York, News, Politics, Republican Party, Republicans by Editor (Retired). Bookmark the permalink. Unfortunately, it seems there is no depth of assholery to which Republicans can plunge without penalty. I’d just like to see Chris Christie start an old-fashioned Jersey City street fight with Boehner. Not a pretty picture. But I’d like to be there to capture it on video! Boehner would go down in about twelve minutes, tops.